BMW'x junior SUV, the X1, is based largely on the 3 Series, though its higher ride height and more off-road orientated looks add some real appeal. 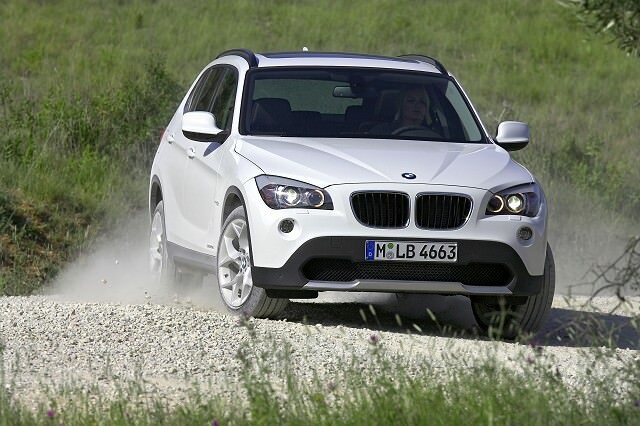 BMW's smallest SUV offering, for the nursery rather than the school run, the X1 has been around since 2009. It's based largely on the 3 Series, though its higher ride height and more off-road orientated looks add some real appeal. While it might look more rugged than BMW's saloon offerings, the majority only feature rear-, instead of four-wheel drive, so if you need the added traction offered with all wheels driven be sure to select the right model. BMW's X1 bridges the gap between the more mainstream SUV offerings and the upmarket choices from rivals like Audi's Q3. It's relatively small, but being a BMW its focus is still largely centred on driving dynamics, which means it's a fun drive regardless of which model you choose. Despite its more obviously off-road looks and X badge the majority of X1s are rear-wheel drive rather than four-wheel drive. The sDrive badge denotes that only the rear axle gets power, xDrive signalling that all four wheels are driven. The cheapest X1 16d models are only offered in sDrive form, while the X1 18d is offered in both, as is the X1 20d. The range-topping 25d is only available with xDrive four-wheel drive. BMW builds the X1 with petrol engines, but they're not sold in Ireland. Trim lines follow the BMW norm, so there's SE and M Sport, with xLine and BMW Sport Line also available. All come decently equipped as standard, with alloy wheels, electric windows and air conditioning on all. Sport and M Sport models add stiffer suspension for a more sporty drive, SE offering a better compromise on rougher roads thanks to greater compliance from its suspension. Visually the trim lines differ slightly too, with the Sport models gaining a more assertive look inside and out. For those looking for ultimate economy BMW also offered an EfficientDynamics model, from 2011 onwards, though all X1s come with decent efficiency and emissions, particularly in sDrive form. Automatic gearboxes are offered as an option, earlier cars making do with a six-speed unit, some later models specified with an excellent eight-speed automatic. Browse the classifieds and you'll find little deviation from the sDrive18d SE model, and there's good reason why. It offers the best blend of day-to-day performance, good economy and an agreeable standard equipment list. It's the one we'd recommend for all those reasons. The X1 is a sportier take on the small SUV that might lack the outright space of its similarly priced mainstream rivals, but comes with a heap of prestigious badge and driving appeal. On the used market it's a decent buy, though be careful picking the right model for your needs, as the majority don't actually offer the off-road four-wheel drive capability its looks promise.